The lawsuit demonstrates that the poor and disparate educational performance of New Mexico’s children is connected to a lack of resources provided to schools. Numerous educational experts and legislative task forces and committees, as well as studies, have drawn attention to the insufficiency of funding for public education in New Mexico. A 2008 report by the American Institutes of Research (AIR)2 found that operational expenditures were underfunded statewide by about $350 million, or nearly 15 percent, at that time. 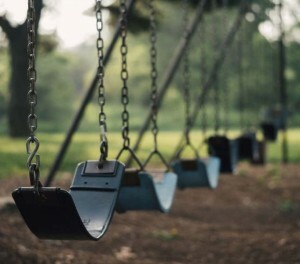 Also, a recent report from the state Legislature found that New Mexico and Mississippi direct less funding to serving at-risk students than do all other states, despite the large numbers of at-risk students in these two states. Notably, both New Mexico and Mississippi consistently rank at the bottom in assessments of student outcomes. Like school systems in almost all of the 50 states, New Mexico public school revenue fell sharply during the Great Recession (see Figure I). 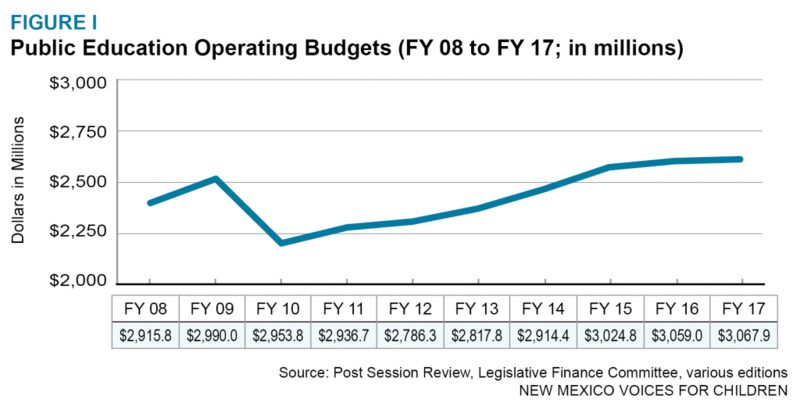 New Mexico policy-makers addressed the revenue crisis by slashing state spending on public schools and temporarily plugging the gap with federal revenues from the 2009 American Recovery and Reinvestment Act (ARRA). The availability of federal ARRA funds in the 2010 and 2011 school years helped mitigate the state cuts to the school system. Public education appropriations were not restored to the 2009 level until fiscal year 2015 (FY15). However, funding still had not recovered to 2008 levels on a per-student, inflation-adjusted basis. This is because in most years the number of students enrolled in public education grows and inflation chips away at the value of educational expenditures. Given the past eight years of experience, the number of students can be expected to grow by about 0.34 percent per year. A forecast of the Consumer Price Index by the state of New Mexico’s Consensus Revenue Estimating Group shows inflation hovering around 2.5 percent through FY20. However, appropriations grew by about $34 million in FY16 and about $9 million in FY17—or less than is needed to keep pace with inflation and population growth. Given that the public school appropriation from the state general fund was $2.648 billion in FY17, general fund appropriations for the next three years would need to grow by $74 million (2.84 percent) in FY18, $72 million (2.64 percent) in FY19 and $76 million (2.74 percent) in FY20 merely to keep pace with inflation and growth in the number of students. In addition, the base budget would need to have been increased by $400 million in FY17 to reach the 15 percent increase recommended in the AIR report. Public school finance in New Mexico is quite centralized: most funding comes from state-level sources rather than local sources, as would be the case in a state that relied heavily on the property tax. 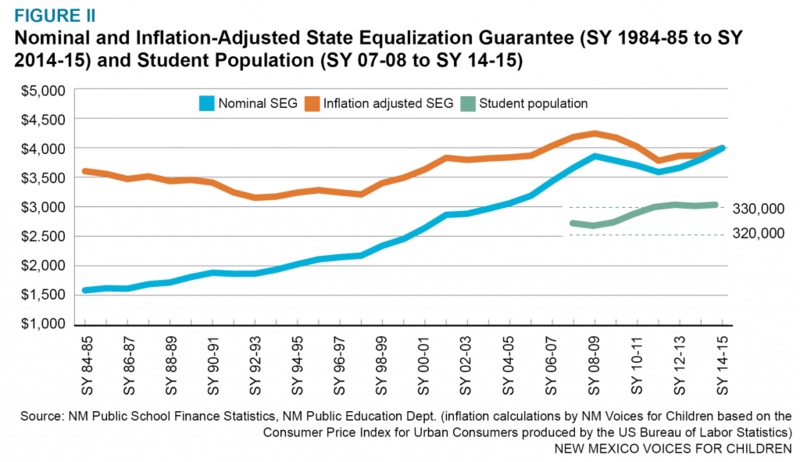 The State Equalization Guarantee (SEG) is the formula that New Mexico uses to distribute funds to the state’s 88 school districts. The SEG is driven mainly by school ‘average daily membership’ or student counts. Total appropriations for the public schools are divided by the number of projected units to derive the SEG unit value. The SEG makes it possible for there to be some local control over how funds are spent even though the funding system is centralized. The blue line in Figure II shows that the SEG increased smoothly for almost three decades—from school year 1984-85 to SY 2008-09—before dropping at the onset of the current recession, from which New Mexico is still struggling to recover. The orange line, which provides a picture of the value of the SEG adjusted for inflation, shows a much more truncated growth trajectory. As the SEG fell in SY 08-09, student enrollment in the state’s public schools was trending slowly upward at an average rate of about 0.34 percent (the green line). The state’s public schools were expected to do more with less. Broadly speaking, there are four uses of revenues in the Public Education Department accounting system: operational, special projects, capital outlay, and debt service. Each of the uses relies on revenues from different sources, but only operational and special projects revenue are included in the SEG. Revenues going to each of the four classifications fluctuated in different ways during the past eight years. Revenue for the largest classification—operational expenses—fell during the recession and began a slow recovery in SY 11-12. In contrast, revenues for ‘special projects’ increased during the recession, as federal funding accounts for a significant share of revenue for this category. This funding includes a wide array of programs, from school lunches to Title I funds for schools in high-poverty neighborhoods. By combining operational and special projects revenues we get a more focused picture of the resources available to school districts. 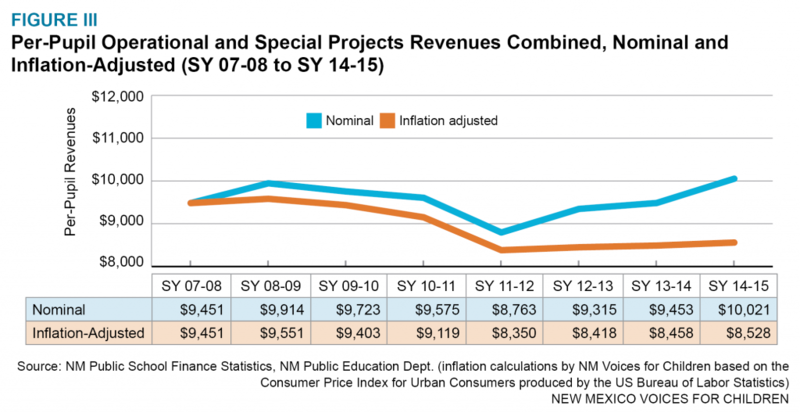 Figure III shows nominal and inflation-adjusted per-pupil revenues for operations and special projects combined. Inflation-adjusted revenues reaching $8,528 in SY 14-15 were still below the peak reached in SY 08-09 ($9,551). An issue that has come to the fore in the school funding discussion in the past five years is that of the amount of school funding provided through the SEG and the amount appropriated apart from the SEG, which is referred to as below-the-line funding. The fact that an increasing amount of funding does not go through the SEG may be seen as a problem for local school districts, because non-SEG funding is earmarked for specific purposes and cannot be used for the priorities of the local school districts. Arguably, local school districts are closest to their specific problems and may be better able to respond to local issues. Figure IV shows that the SEG unit value has risen from $3,871.79 in FY 09 to $4,027.75 in FY 16. This represents an increase of $156 or 4.03 percent over that time period. Figure V shows that ‘below the line’ or non-SEG appropriations have increased at a significantly steeper rate, from $39.6 million in FY 09 to $101 million in FY 16. 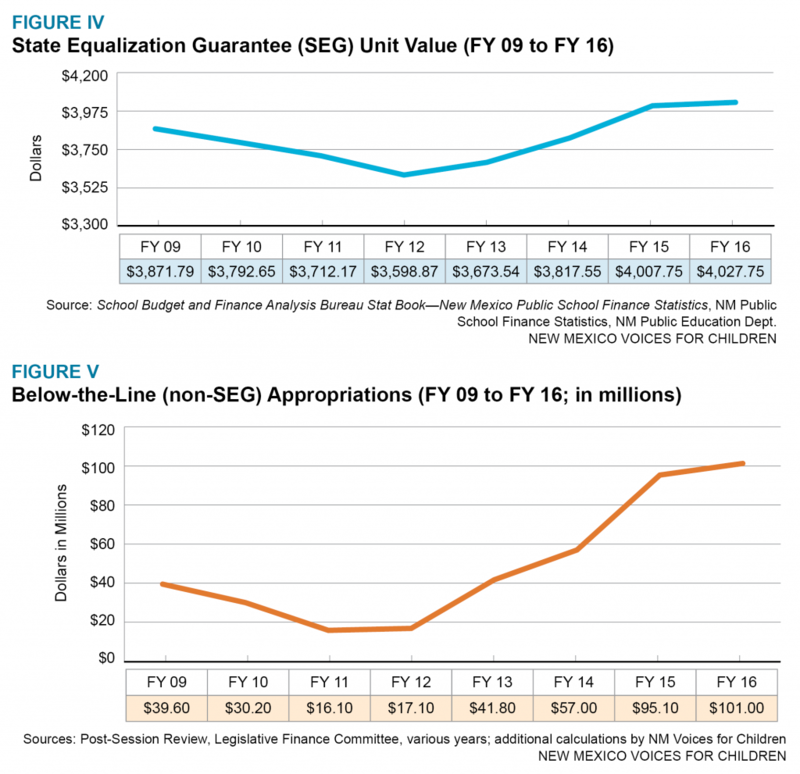 The increase in non-SEG funding represents movement away from the principles of the state’s system for funding public schools, which is intended to provide equality of opportunity irrespective of the relative wealth of individual school districts. In conclusion, the Great Recession inflicted a serious blow to New Mexico funding for public education. It has taken eight years to emerge from the havoc created by that economic earthquake. In addition, most years the number of students enrolled in public education grows and inflation chips away at the value of educational expenditures. The lawsuit filed by the New Mexico Center on Law and Poverty has described the problems facing the state’s public education funding system in detail. This report maps out the recent history of public school funding and the continued erosion of the resources going to the school system. Following the recommendations of the 2008 American Institute for Research study to increase public school funding by at least 15 percent would be a way to begin solving the funding problem faced by the New Mexico public school system. This would add about $400 million to the FY 17 appropriation of $2.648 billion. This increase would establish a new base of $3.048 billion from which to build in future years.